A visit to Pula and a tour of its cultural heritage is a real challenge, since Pula truly abounds in cultural monuments. During your stay in Pula don’t miss the Naval cemetery at Stoja, situated close to the lovely Valkane cove, a favorite promenade of the inhabitants of Pula. The former Austro-Hungarian cemetery (K.u.k Marinefriedhof) was opened in 1862, for which the Ministry of the Navy purchased four thousand square meters of land. Today the cemetery spreads over an area of more than 22 thousand square meters, and according to available data, about 150 thousand people have been buried there. Naval cemeteryA walk through the Naval cemetery is surely a walk through a magnificent park, because the cemetery was arranged and renovated in 1990 with the help of the Austrian Red Cross and German national association for the care of war graves. 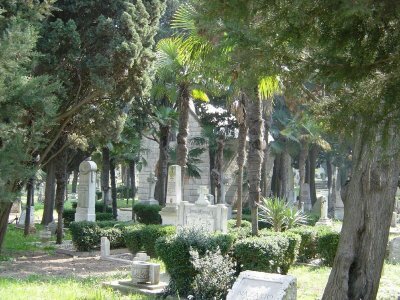 But, a walk through the Naval cemetery is also a walk through the history of Pula. At this cemetery 12 Austro-Hungarian and one Turkish admiral were buried, some three hundred Italian and German soldiers, as well as victims of the Baron Gautsch disaster, and the crews from the battle ships Szent Istvan and Viribus Unitis. The cemetery is on the list of monuments under the protection of the Hague Convention.